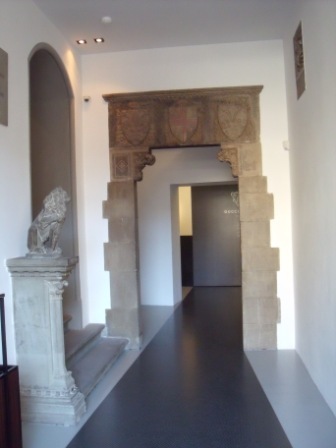 Ten days ago, in Palazzo della Mercanzia in Florence was inaugurated the Gucci Museum. The building , located in the heart of Florence, on Piazza della Signoria, is a historical one, called della Mercanzia because it housed the Ufficio della Mercanzia, set up to protect the so-called Arti, which means Guilds. Gucci, well known all over the world fashion firm, exposes in this prestigious space part of its vintage collection. 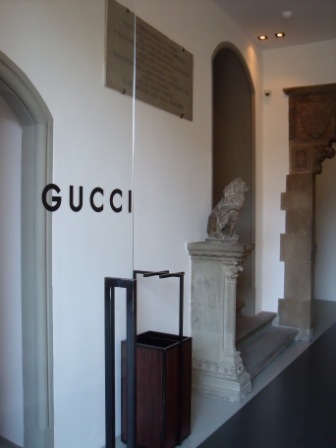 On the ground floor, the travelling collection, the starting point of Gucci’s history which is connected to the fact that when young, Guccio Gucci, the founder, worked as a lift boy in Savoy Hotel in London. Marvelous cases and trunks mostly from the ‘60s to 80’s in all typical Gucci fantasies: GG fabric, waxed fabric,diamante fabric and materials: pigskin, suede, leather. On the same floor an impressive Cadillac Seville Gucci edition from 1979,with a vinyl top covering with the double “G” fabric pattern, the GG symbol on the wire wheel covers, and a red/green stripe across the lower edge of the car. Climbing the stairs to the upper floors, one can admire the historic photos of laboratori Gucci since the ’40s and pictures of famous customers visiting the Gucci stores in the ’60s and ’70s. The first floor stars with Flora world a space where the delicate motive of flowers reign as sovereign. The story tells that in 1966 when Princess Grace of Monaco visited the shop in Milan, Rodolfo Gucci decided to offer to her an original floral scarf. So the famous illustrator Vittorio Acconero was asked to create a series of designs of flowers and fruits and insects from the for seasons. The original designs are exposed in this space together with scarves and clothes with this Flora design. Next space is dedicated to handbags, in different materials and original forms with various Gucci symbols like the double G, the horsebit and the green/red strip, beginning from the ‘40s. Are visible here images of the handycraft in Gucci bags’ creation, mostly done Florence and Tuscany. The Evening Wear Space, collects special red carpet wear and images of international stars wearing Gucci’s gowns. The floor also hosts a Precious Space and a Contemporary Art Space, currently hosting Bill Viola works. The exhibition on the first starts with Logomania, various objects decorated with Gucci symbols which are the double G, in various shapes and sizes, the Diamante pattern, the horsebit pattern. Last rooms of the museum are dedicated to Lifestyle , leisure and relax and gifts, and Sports space, from riding to tennis and golf.